Shadi Al-Atallah is best known for their large scale paintings of dark and dynamic figures. 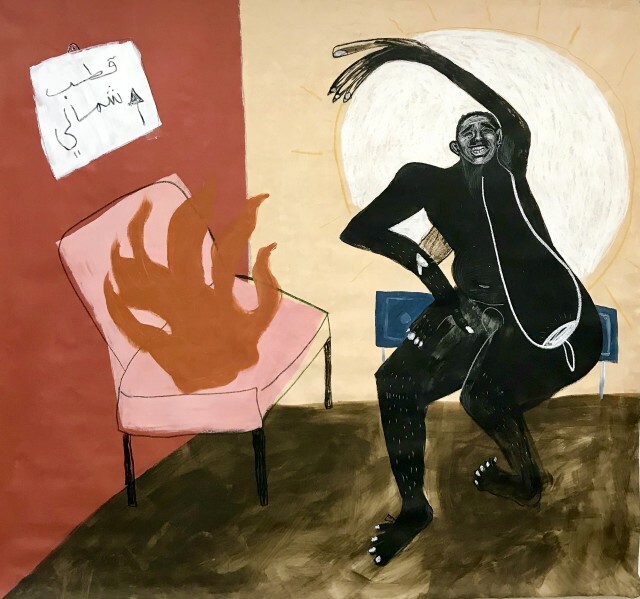 These abstract and cathartic self-portraits reference both Al-Atallah’s childhood in Saudi Arabia and the intersections of their mixed-race queer identity. This exhibition of new works follows on from Al-Atallah’s ‘Catharsis’ series, which sees the artist investigate healing as a concept, and examines the relationships between spiritual practices, mental health and the body. The imagery recalls the spirit conjuring dances practiced amongst Arabs of African descent in the Arabian Gulf Region, as well as modern interpretations of expulsive dancing such as voguing. Al-Atallah most recently exhibited the series in the ‘BBZ BLK BK: Alternative Graduate Show’ which showcased the work of 10 queer artists of colour. Al-Atallah is currently studying Painting MA at Royal College of Art.